3 Gal gas tank that provides about 3 – 3-1/2 hours of run time. The blade spindles used on the AcrEase are built out of heavy duty welded steel hubs, 25 mm (1″) shafts and large greasable bearings. The cutting height is easily adjusted from 1.5″ – 5″ by turning two cranks. The AcrEase Finish Cut Mowers come with large 23 HP electric start engines. The low profile design of the AcrEase makes it very easy to mow under low branch trees. There is no need to get beat by branches when the AcrEase is attached to the side of the tow vehicle. The mower is equipped with an electric clutch for blade engagement. The AcrEase Finish Cut Mowers have two different types of hitching available. 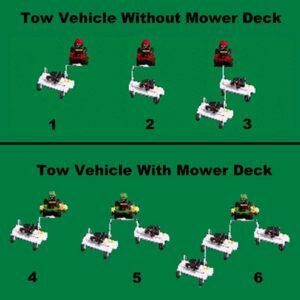 These are the Lawn & Garden Hitching which works best with riding mowers and zero turn mowers and the ATV Tongue which works best with tow vehicles that do not have their own mowing deck. With the Lawn & Garden Hitching there are a variety of ways that multiple wing mowers can be pulled. The AcrEase deck is the heaviest built in the industry. The main deck is built out of 10 GA (.135″) thick steel with an 7 GA (.179″) thick steel top reinforcement plate. The deck design also features a wide side discharge, deep deck design and 3-20″ blades which are inline. All of these features increase capacity and cut quality. Other standard features are 6 anti-scalp wheels and a front and rear safety zone.